A church in Entebe, Uganda. Check out the city of Entebe when you visit Uganda. You can enter the country right at the Entebbe International Airport which is considered to be the country’s largest commercial and military airport. This city is home to mostly civil servants and government ministers. In fact, the residence of the president of Uganda, commonly referred to as the State House, is located in Entebbe. The city of Entebbe is considered to be the cleanest and greenest in the whole of Uganda. There are local regulations that have preserved the city’s flora and fauna despite developments in business and infrastructure. 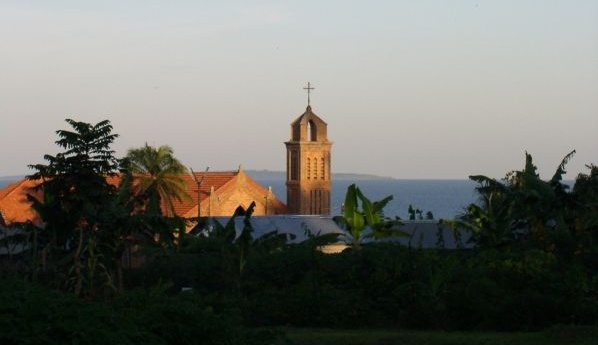 The residents and local city officials of Entebbe have succeeded in maintaining an environmentally friendly modern city with much of the old culture still present. In congruence with its environmental thrust, Entebbe is home to a number of institutions focusing on nature and wildlife preservation. You will find the extensive National Botanical Gardens in Entebbe. These gardens trace a long history with already over a century of existence. The Uganda Wildlife Education Center could also be found in Entebbe. Foreigners and locals alike can visit the center which also serves as the national zoo. Do not be surprised to see wild monkeys over your head as they sit in the tree branches forming a canopy over the paths weaving around the education center. Also in Entebbe, you can find the shores of Lake Victoria. This lake is considered to be the second largest fresh water lake in the country. Within a few miles due northeast of Entebbe is the capital city of Uganda, Kampala. You can have rest and relaxation in any one of Entebbe’s two five-star hotels. There is also a sports complex where you can engage in leisure activities.